The mysterious disappearance between 1587 and 1590 of the English colonists on Roanoke Island, known as the "Lost Colony," spawned numerous legends and ghost stories among the people who later settled in coastal North Carolina. The most popular of these tales concerns Virginia Dare, born on Roanoke Island on 18 Aug. 1587 and the first child of English parentage born in the New World. Nine days after the birth of the child, Virginia's grandfather John White, the governor of the Roanoke Island colony, set sail for England in an attempt to obtain assistance for the colonists. According to legend, not long after White's departure, Wanchese, one of the local Indians who visited England with White, launched an attack against the colonists. Among the few survivors of the massacre were Ananias and Eleanor Dare and their daughter, Virginia. Manteo, another Indian who visited England with White, rescued the Dare family. Virginia's parents died, and Manteo's people cared for the little girl, whom they called Winona. Under the tutelage of Manteo, she learned the ways of the forest as she grew into womanhood. Many of the local Indians competed for Winona, but she chose the handsome Okisko. When she rejected Chico, a sly old witch doctor, he resolved that if he could not have her love, no one would. Using his powerful magic, Chico cast a spell on the young woman, transforming her into a snow-white doe. During the years that followed, the magnificent animal was seen moving gracefully about the island landscape. Sometimes the doe gazed toward the sea as if longing for the return of John White. In the meantime, the heartbroken Okisko sought to reclaim his lost love. He traveled to the shores of Lake Mattamuskeet to consult with Wenaudon, a mighty medicine man known to be Chico's rival. Wenaudon obliged the young brave by providing him with a magic oyster shell-tipped arrow. Wenaudon assured Okisko that if the special arrow pierced the heart of the white doe, she would change back to the lovely young maiden known to the brave as Winona. For many months the unusual deer eluded hunters, causing great consternation among the Indians on the island. Sensing the anxiety of his braves, the evil Wanchese ordered a hunt for the white deer. A determined Okisko, armed with his special arrow, began the hunt hoping to be the first to find the beautiful deer. He spotted her bounding from the forest at the water's edge. However, at the same moment, Wanchese also caught a glimpse of the animal. Okisko let his magical arrow fly, and it found its way into the heart of the target. Unfortunately, at the same time Wanchese sent a silver arrow, a gift from Queen Elizabeth, into the deer's heart. 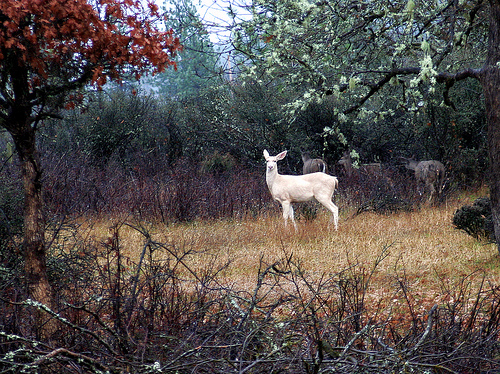 A thick gray mist covered the white doe as the wounded animal collapsed. When the mist dissipated, Okisko was thrilled to find Virginia Dare, or Winona, lying on the ground. But as he took her into his arms, his elation turned to despair when he saw that the silver arrow had killed the love that he had lost and found once again. He wrapped her body in his mantle and buried her in the middle of the fort abandoned years earlier by Virginia Dare's kinsmen. Well into the twentieth century, hunters emerged from the forests of Roanoke Island with tales of a strange deer that eluded them in the wilderness. It appeared suddenly in the darkness of midnight and vanished in the mist of dawn. Longtime residents of the island who heard the story time after time had no doubt that the identity of the mysterious phantom deer was the ghost of Virginia Dare. Nancy Roberts, North Carolina Ghosts and Legends (1991). Charles Harry Whedbee, Legends of the Outer Banks and Tar Heel Tidewater (1966). "White Deer." Image courtesy of Flickr user Beyond the Trail, uploaded on December 15, 2009. Availale from http://www.flickr.com/photos/garytrinity/4190752606/ (accessed May 31, 2012). What a beautiful tale of love lost in time. I think that this is the coolest theory so far.